I still remember the play. Opening Day 2003, Yanks are playing the Jays in Toronto and leading 1-0 when Derek Jeter walked with one out in the third inning. The next Yankee hitter, Jason Giambi hit a dribbler between the mound and third base. Jay third baseman Erik Hinske, shortstop Chris Woodward and pitcher Roy Halladay all went after the ball with Halladay reaching it first and nailing Giambi with a good throw to first. Meanwhile, Jeter raced to second and when he saw that neither Hinske or Woodward was covering third he kept running. Ken Huckaby, the Toronto catcher also saw that third base was uncovered and he ran like hell to get there before Jeter. In the mean time, first baseman Carlos Degado threw a bullet to the third base bag, hoping Huckaby would get there before both the ball and Jeter did. Jeter got their first and was safe on the play but a millisecond later, Huckaby arrived and when he tried to catch the ball and stop at the same time, he barreled into the Yankee shortstop, separating his shoulder in the process. Jeter went on the DL for the first time in his career and everyone wondered, what will the Yankees do without their shortstop. The immediate options to take his place were Enrique Wilson, who was the utility infielder on that year’s Yankee roster or Erick Almonte, who was considered the organization’s top minor league shortstop at that time. The Dominican native had put together some decent offensive seasons in the Yankee farm system up to that point but his bat had actually been regressing more recently. In fact, the year before Jeter’s injury occurred, New York had demoted Almonte from triple A to double A because of his inability to hit. That’s why everyone was pleasantly surprised when the Yanks decided to go with Almonte and he got off to a torrid start at the plate when he was called up to the Bronx. In his first game he homered, went 2-for-5 and drove in three runs. He hit safely in six of his first seven games and was averaging .333 after his first ten days as the Yankee shortstop. He would tail off a bit but was still hitting .272 when Jeter returned to the lineup in early May and the Yankees were in first place with a three game lead and a 26-10 record. While Yankee fans had missed the Captain, the truth is the Yankee team hadn’t. Erick Almonte had stepped up big time in Jeter’s absence. He would never get another chance to do so. He was sent back down to Columbus for most of the rest of that 2003 season. He would later sign as a free agent with the Rockies and then play ball in Japan for a few years. 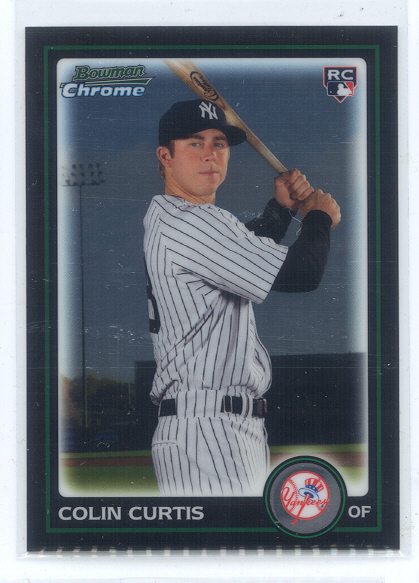 He did not get back to the big leagues until 2011, when he made the Milwaukee Brewer roster as a spare outfielder. Unfortunately, he was beaned pretty severely and didn’t get a chance to play much. As of 2013, he was still playing minor league baseball. He turns 36-years-old today. He shares his birthday with this former Yankee reliever, this Gold-Glove-winning center fielder, this one-time Yankee prospect and the player the Yanks got when they traded Tom Tresh. 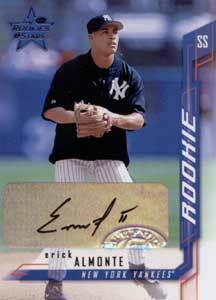 When I saw the name of today’s Pinstripe Birthday Celebrant it instantly brought back good/bad memories. My good/bad memories are reminisces that at the time they originally occurred, gave me agita but now, remembering them decades later, they actually make me smile. When I first started watching Yankee baseball in 1960, the team was almost unbeatable and when one of New York’s players got old, injured or drafted into military service and a replacement was needed, they’d reach down inside their well-stocked farm system and bring up a talented replacement. In 1962, for instance, rookies Tom Tresh, Joe Pepitone and Jim Bouton all made meaningful contributions to a Yankee team that won its second straight World Championship. But just a few seasons later, that had all changed. Since almost the beginning of the franchise, the Yankees had been owned by very wealthy individuals with immense personal fortunes who loved winning. They’d pour huge amounts of money into the team’s farm system and sign up the best young talent from around the country. In 1965, however, the Yankees were sold to CBS, a corporation of stockholders concerned with just one thing, profits. At the same time, Major League Baseball instituted its amateur draft, which for the first time rewarded the teams with the worst records the ability to select the rights to sign the best amateur players in the country ahead of the teams with the best records and the most money. There would be no more 1962’s for a long long time in Yankee universe. The farm system was gutted during CBS’s reign of error and that’s why Ron Woods got to wear pinstripes in the first place. By 1968, the Yankees had become one of the worst teams in the American League. They needed to replace their entire outfield and since prized franchise prospects like Steve Whitaker, Roger Repoz and Ross Moschitto all fizzled, Yankee GM Ralph Houk found himself forced to trade Yankee veterans for the best prospects of other teams. That’s why in 1969, New York traded Tresh to Detroit for a young outfielder named Ron Woods. There were times during the previous seven seasons in the Tiger farm system that Woods looked like he had the potential to become one of those special five-tool outfielders. Unfortunately for Houk and the Yankees, potential on the farm doesn’t win games in the majors. 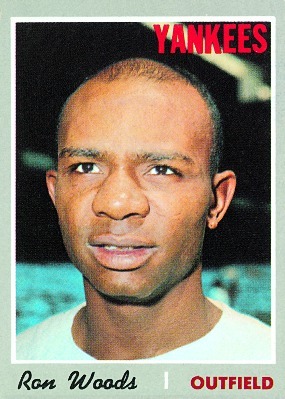 Ron Woods was a complete bust during his two plus seasons in the Bronx. In 192 Yankee games between 1969 and ’71, he averaged just .208 with 10 home runs and only 36 RBIs. Even his greatest play as a Yankee turned out to be a mirage. Woods had fallen head first into the stands chasing a long fly ball and knocked himself unconscious. His Yankee outfield teammate, the late Bobby Murcer had reached over the wall and held up the ball, as if he had grabbed it out of Woods glove and the umpire signaled the batter was out. Years later, when he was announcing Yankee games, Murcer admitted during a televised broadcast that he had found that ball lying next to and not inside Woods’ glove. New York gave up on Woods in June of 1971, trading him to Montreal for the ex-Met, Ron Swoboda. Woods remained an Expo through the 1971 season, ending his 582-game big league career there with a .233 lifetime batting average. He shares his birthday with this former Yankee reliever, this Gold-Glove-winning center fielder, this former Yankee shortstop and this one-time Yankee prospect. 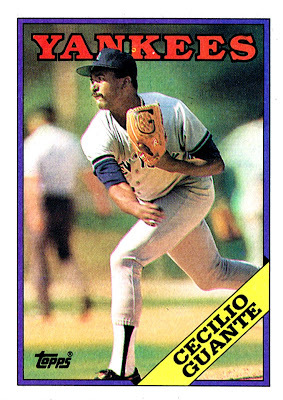 Cecilio Guante became a Yankee in one of those “win now, worry about the future later” type deals George Steinbrenner so often pushed and approved during the 1980s. This one took place in November of 1986 and sent future Cy Young Award winner, Doug Drabek along with Brian Fischer and Logan Easley to Pittsburgh for the Pirates’ top starter Rick Rhoden, Guante and a pitcher named Pat Clements. As the Yankees hoped, Rhoden had a good year for New York in ’87, going 16-10 but Guante, who had been a workhorse in Pittsburgh’s bullpen for the previous two seasons, got hurt and then got lost in manager Lou Piniella’s bullpen. The following year two things happened that impacted Guante’s playing time. Billy Martin took over as Yankee Manager and Dave Righetti, New York’s all-star closer, came down with a tender pitching elbow. Since Rags threw from the left side and Guante was a right-hander, Martin began platooning his closer slot between the two of them to save wear and tear on Righetti’s elbow. For quite a while, the move worked. Guante was a tall mean-looking guy on the mound who loved to throw inside and up and in to intimidate opposing hitters. He also barely spoke even if spoken to. During the Yankees 1988 spring training camp he did open his mouth but only to request a trade because he did not think he figured in the Yankees’ bullpen plans that season. Righetti’s sore elbow had solved that problem. He started the year off hot and busy, appearing in 25 games during April and May, winning twice and saving five more. But in June he hit a rough patch. Though he saved four games that month he also blew saves in four others. You could actually feel the Yankees’ confidence in the guy eroding with each bad outing and sure enough, before the season was even over they had dealt Guante to Texas for a reliever named Dale Mahorcic. 1988 was also Rick Rhoden’s last year in pinstripes. Cecilio’s last big league game was in 1990. His career record was 29-34 with 35 saves. He compiled a 3.45 ERA in the 363 games he appeared in during the nine seasons he pitched in the big leagues. Guante was born on February 1, 1960 in the Dominican Republic. He shares his birthday with this former Yankee shortstop, this former Gold Glove-winning center fielder, this one-time Yankee outfielder and this one too. Yankee fans will probably never see Colin Curtis play another game in Yankee pinstripes. That’s because in 2010, this native of Issaquah, WA hit just .186 during his 31-game, New York debut in 2010 and is no longer with the organization. Despite his inability to prove he was a big league hitter, it was fun watching this former Arizona State ballplayer get his shot to do so. When he first came up, he impressed me with his ability to lay off bad pitches and spoil good ones late in the count. I also remember his first and only home run in 2010. It was a pinch-hit, three-run blast against the Angels at Yankee Stadium. But as the season wore on and opposing teams accumulated scouting information on Curtis, they began getting him out regularly and he started taking weak hacks instead of good swings in the process. Doctor’s found testicular cancer in Curtis when he was just fifteen years old. He underwent an operation and it was discovered the cancer had spread. Fortunately, the surgery and subsequent treatment worked and the outfielder has been free of the disease for over a decade. Other members of the Yankees’ all-time roster who celebrate a birthday on the first day of February include this former Gold-Glove winning center-fielder, this former reliever/closer, this former Yankee shortstop and this former outfielder. 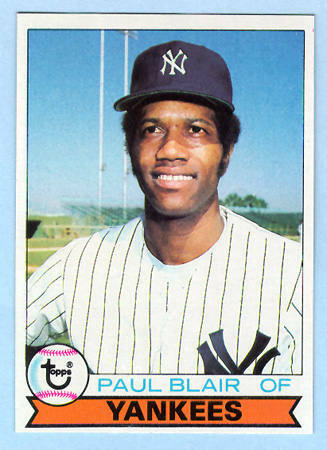 Paul Blair’s best days were behind him when the Yankees traded their former starting center fielder, Elliott Maddox to the Orioles in January of 1977, to acquire the eight-time Gold Glove winner. For the next two seasons, New York used Blair mostly as a late-inning defensive replacement for the moody Mickey Rivers. Blair performed perfectly in that role and won two more World Series rings while in Pinstripes to add to the two he had already won with Baltimore. His most famous Yankee moment took place in a June, 1977 game against the Red Sox in Fenway and as usual, Blair was sitting on the bench when that contest started. At the time, New York was two games behind the Red Sox in the AL East pennant race and the mercurial Billy Martin was trying to fend off the meddling of Yankee owner George Steinbrenner with his on-the-field moves. At the same time, Martin hated his star player, Reggie Jackson and the feeling was mutual. In the sixth inning of the contest, Jim Rice hit a ball to right field and Jackson misplayed it into a double for Rice. A livid Martin felt Reggie loafed on the play and immediately sent Blair to right field to replace his outspoken superstar. I’ll never forget Blair shrugging his shoulders as a disbelieving Jackson ran past him toward the Yankee dugout. The chaotic scene that followed in the Yankee dugout has to be one of the low points in Yankee franchise history. Blair, who was born in Cushing, Oklahoma on February 1, 1944, was once asked to compare playing for his Oriole manager, Earl Weaver to playing for Martin. Blair responded that both were fiery and demanding but that Weaver was forgiving while Martin held grudges forever. He died December 26, 2013, suffering a heart attack while bowling. Blair shares his February 1st birthday with this former Yankee shortstop, this former Yankee reliever/closer, this former outfielder and this one too.